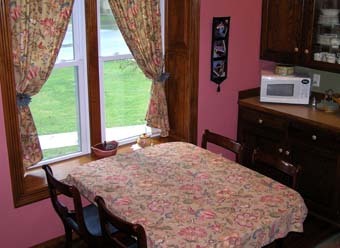 Located in Anne's House of Dreams, Four Winds has solid Brazilian cherry floors, cherry doors and trim, two window seats, and a lovely oak kitchen furnished with dishes, cooking and baking pans, a dishwasher, a self-cleaning electric range, a refrigerator with an ice maker, a microwave, desk, and dining room table. The first floor bathroom features a romantic double shower with an Italian quarry tile floor and walls. 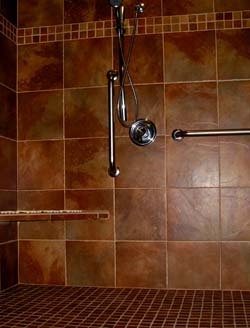 The shower is fully handicap accessible, with a bench and an adjustable height showerhead. A stacked washer and dryer is also present for use by guests and staff. Circa 1891 house next door to the Blue Belle Inn with double shower, handicap ramp, deck, kitchen, desk, laundry, queen sized Murphy bed with a memory foam mattress, and a full sized futon. Private entrance.